The country’s business process outsourcing (BPO) segment is not as enthusiastic as others in the information technology (IT) sector on a revival in growth in 2014-15. Earlier this week, the National Association of Software and Services Companies (Nasscom) projected revenue for the overall sector would increase 13-15 per cent year-on-year next financial year. Executives of top BPO firms told Business Standard the projection might be “misleading” and the BPO segment would take another two years to be back on track. Susir Kumar, chief executive officer (CEO) of Serco Global Services, the global BPO division of Serco, said demand for IT was largely due to hope of a recovery. “I would be lying if I tell you that BPO is seeing the same growth right now.” Kumar added though in the US there were no signs of growth faltering Europe was still struggling and growth in emerging markets remained flat. While the IT-BPO sector is targeting a combined revenue of $300 billion by 2020, BPO has set a goal of $50 billion in revenue by 2030. Sandip Sen, global CEO of Aegis that operates in 35 countries, said Nasscom and the BPO Council set up by it were working to bring out separate projections for IT and BPO segments. “Next year’s business will be better but 13-15 per cent growth is misleading, as the concept of growth between IT and BPO is different.” Double-digit growth for BPO might be difficult, he added. BPO sector has faced challenges on multiple levels. While its bread and butter business, voice, moved to cheaper regions such as the Philippines, pressure from clients to cut costs through automation hurt revenue, based on the headcount model for long. Moreover, entry of large IT players into BPO has further intensified competition as more clients look for integrated IT-BPO deals. 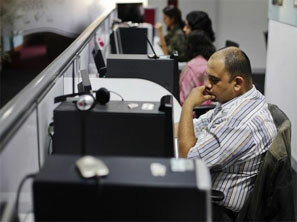 Consequently, many BPO players are tying up with IT companies. However, the dominant view in the sector is clients still prefer separate vendors for IT and BPO contracts. Keshav Murugesh , chief executive officer of WNS Group, said this was due to the fact that buyers of technology and BPO weren’t same. WNS expects to grow 11 per cent year-on-year in the current financial year, said Murugesh adding the sector would evolve to offer specialised services. Only around a fourth of its business is voice, with the rest coming from data; 36 per cent of its revenue is not dependent on headcount. While the growing popularity of digital and social media is eating into revenues, as for their counterparts in IT, automation through artificial intelligence is proving to be an even bigger threat to the business model. Mohit Thukral, senior vice-president of Genpact, the country’s largest BPO firm, said while only 15-20 per cent of contracts were integrated IT-BPO deals, the company was targeting almost 40-50 per cent of automation, including using robotics.